Not all the tanker trucks you see plying the streets in Italy are delivering that golden liquid, gasoline. Many are delivering vino sfuso, or bulk wine. Vino sfuso is table wine served in a pitcher or liter decanter (or half-liter or quarter-liter) in restaurants across the country. If you ask a waiter to bring you the vino della casa (house wine), most of the time it will be bulk wine that you get. 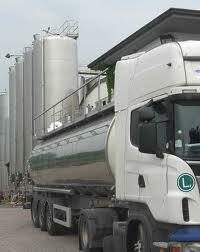 And before you turn up your nose at the idea of drinking wine from a tanker truck, think about this. Wine that goes from producer to point of sale via tanker bypasses bottling, corking, labeling, and packing machines. Usually, it’s delivered by the producer to the seller with absolutely no intermediary. Those factors represent substantial cost savings that are passed on to consumers. In fact, some producers make wine solely for the bulk market. They pay just as much attention to production methods as other vintners. Recently, I enjoyed lunch at a remote farmhouse restaurant in the country with a group of culinary writers. All the food had been cooked from local, organic products and made by hand—a superb meal. The owners sat down with us as we lingered over our tasty wine. A vino sfuso. They told us they make periodic trips to a nearby town, their car laden with five-liter jugs. And they pay €1.50—that’s about 1.12 euro or $1.40 for a standard bottle of wine. And it was really quite good. Not a Brunello, but good. Vino sfuso is not reserved for restaurants and bars, however. Anyone can buy it. Some small mom-and-pop grocery story feature two or four tanks with modest choices of white and red wine. There are also shops devoted to vino sfuso with a dozen or more tanks offering as many varieties of wine. To buy, you can bring your own container. Used plastic water bottles are common choices, but many people who use lots of wine (for both cooking and drinking) opt for the five-liter jugs. I have a glass bottle with a bale wire and ceramic top that I like to have filled. The shops have containers for sale, as well. Some producers are touting vino sfuso as the green way to go. It’s hard to argue with them. They’ve cut out many costly, energy-consuming steps in getting wine from the vineyards to the table. They’re saving trees by eliminating cardboard cases. And the containers, from the tanker trucks to the bottles, are reusable. Whenever we've visited Italy, we've often ordered the house wine. I love the way they sometimes bring it to the table in a pitcher, and it's always good, way better than house wine would be here. That you can buy it in the market for that price makes me green with envy. Green is the word, I think! Some of them are really very good. In 1998, we rented a medieval cottage in the Rhone Valley of France. 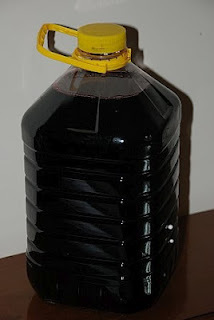 The village had a wine cooperative where you could buy bottles of local wine or bring your own plastic jug and fill it with wine using a nozzle like on a gas pump. Several types of wine were available and all of it delicious. It was the first time I saw the gas nozzle operation for dispensing wine. The gas nozzle is usually used here for filling the tanks within the stores. The stores I've frequented have tanks with a spout near the bottom, and the bottle is filled via gravity. We found a little shop in Santa Marinella, Italy (on the coast north of Rome, south of the port of Civitavecchia). Great Wine, Great experience. I'm looking for a way to find similar stores. Dear Anonymous, you should find this type of wine sold all over the country. Frequently, there is a stall at a market with a few tanks. Sometimes the small grocery stores called "alimentari" also have a couple of tanks. Watch for someone carrying wine in a plastic bottle and try to find out where s/he bought it.